Bangladesh will ask star all-rounder Shakib Al Hasan to return from Indian Premier League and join the team's World Cup preparation camp next week. Keep up to date with all the latest, breaking sports news from around the world from South Africa's biggest sporting website. Sign up today! A quickfire 48 by England's Jonny Bairstow and disciplined bowling helped Sunrisers Hyderabad climb to the top of the Indian Premier League table. Steve Smith made a modest return to the Indian Premier League, scoring 20 for his side Rajasthan Royals as they lost to Kings XI Punjab. David Warner smashed 85 from 53 balls on his IPL comebackbut his knock went in vain as Sunrisers Hyderabad lost to Kolkata Knight Riders. Ravi Ashwin says his IPL team, Kings XI Punjab, are looking to be "competitive and fierce" amid global outrage over his 'Mankad' dismissal of Jos Buttler. Controversy reigned in the Indian Premier League after a "Mankad" run-out incident between Ravichandran Ashwin and Jos Buttler. Harbhajan Singh led an inspired spin attack to help CSK open the 2019 IPL season with a comprehensive win over Royal Challengers Bangalore. Cricket lawmakers MCC insist the rule regarding "Mankad" is essential in the aftermath of the controversy over Jos Buttler's IPL dismissal. Former captain Ricky Ponting Monday lauded David Warner's impressive batting on return to the Indian Premier League. Proteas wicketkeeper-batsman Heinrich Klaasen has secured an IPL contract for 2019 after he was snapped up by the Royal Challengers Bangalore. The Titans have tried their hand at blind cricket in a challenging and hilarious segment on the The Dan Nicholl Show. Former England all-rounder Andrew Flintoff belts out to Imagine Dragon's 'On Top of the World' in 2019 Cricket World Cup promotional video. VIDEO: WATCH: Is this the greatest catch ever? Delhi Daredevils bowler Trent Boult pulled off one of the greatest catches in IPL history as he helped dismiss the dangerous Virat Kohli. 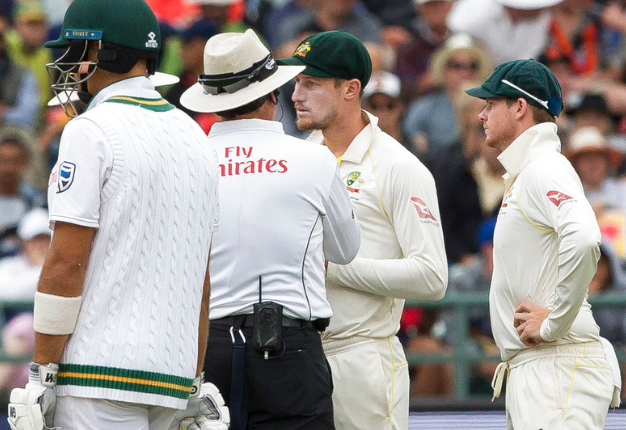 An emotional former Australian skipper Steve Smith breaks down in tears as he apologises for his role in the ball-tampering scandal that rocked the third Test at Newlands. Little-known Indian mystery spinner Varun Chakravarthy hit the jackpot at the Indian Premier League auction Tuesday after he was snared for $1.2 million by Kings XI Punjab. AB de Villiers produced another gem of a half-century for the Royal Challengers Bangalore, but it was in vain as they crashed out of the IPL. ICC to scrap coin toss in Test cricket? Virat Kohli hammered 44 off 19 balls to give the Royal Challengers an improbable four-wicket win in Hyderabad on Friday. The Mumbai Indians put themselves back in the race for a playoff spot in the IPL after beating the Rajasthan Royals. The Chennai Super Kings beat the Kings XI Punjab on Saturday, thrashing them by 97 runs in a one-sided contest. Despite his impressive outings for the Cape Town Blitz in the recently completed Mzansi Super League, Dale Steyn was left unsold during the first round of the IPL auction. Chris Morris has reminded the Proteas selectors what he is about with a simply stunning knock in the IPL. Sunil Narine grabbed four wickets before Andre Russell galloped to a fifty as the Knight Riders beat Kings XI by one wicket. The Delhi Daredevils made light work of the Kings XI Punjab on Friday, winning by nine wickets. Lasith Malinga and Mitchell McClenaghan guided The Mumbai Indians to a 20-run win over the Sunrisers Hyderabad. Defending champions, the Mumbai Indians, have crashed out of the Indian Premier League after losing to the Delhi Daredevils. Hyderabad recorded a six-run victory over the Daredevils, at the Shaheed Veer Narayan Singh International Stadium. An unbroken century stand between Robin Uthappa and Andre Russell guided Kolkata to a revenge victory over Chennai in the IPL. The Rajasthan Royals have cruised to their third IPL win in a row when they beat the Mumbai Indians to top of the standings.